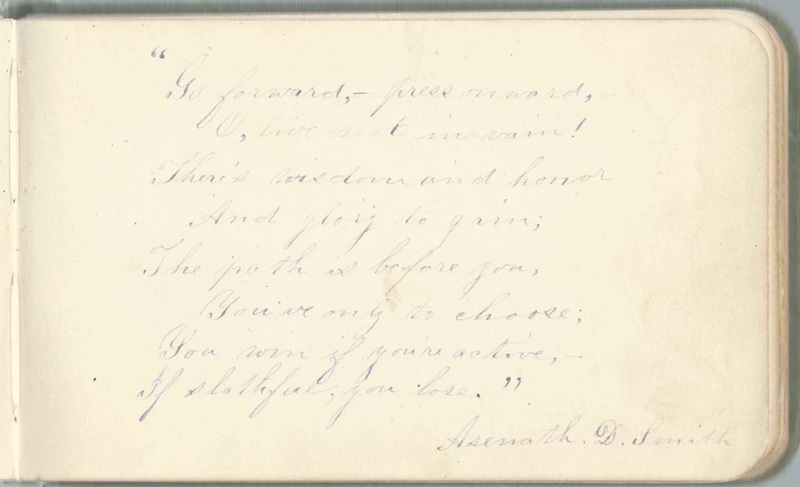 The page above was inscribed in 1881 by Adin L. Smith in the autograph album of his cousin Berniece E. Allen of Centerville, Maine. Adin's mother Asenath Delia (Allen) Smith and Berniece's father Eben F. Allen were siblings, the offspring of Henry and Leah L. (Jacobs) Allen. 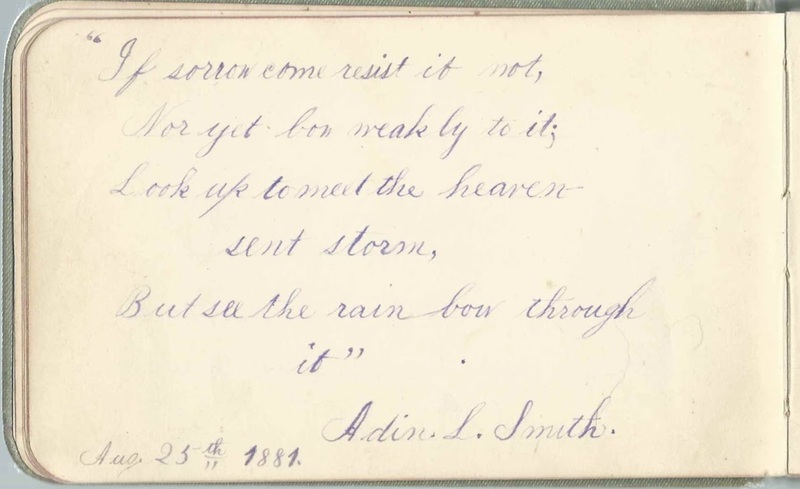 Adin L. Smith was born 21 December 1868 at Jonesboro, Maine, the son of Charles Loring Smith and Asenath Delia (Allen) Smith, who also inscribed pages in the album. In 1894, Adin L. Smith married Alice M. Bridgham. She was born 21 August 1872 at Whitneyville, Maine, the daughter of Zenas W. Bridgham and wife Lucy (Watts) Bridgham. According to the marriage record, Adin was a medical student at the time; he graduated from Jefferson Medical College in Philadelphia, Pennsylvania, in 1894. It's interesting that there was a Dr. Henry Herbert Smith in Machias at the time; perhaps he was an inspiration for Adin, who also established a practice at Machias, Maine. Machias.—June 16, 1903, Dr. A. L. Smith, secretary of the local board of health of Machias telephoned that a man with smallpox had come out from a bark peeling camp on Township 43, about forty miles from Machias. Arrangements were made with Dr. Smith to go into the camp to vaccinate the members of the crew, to disinfect, and to establish such quarantine regulations as might be found to be required. It is not known that any other case resulted from exposure to this one. The men were living in a tent, and left the camp before the eruption was fairly out. A 1920 issue of the American Journal of Public Health indicated that Dr. Adin L. Smith had been appointed District Health Officer for Hancock and Washington Counties, Maine. From what I could determine, Dr. Smith and his wife had two children, a daughter Faye, who married Lawrence E. Merrow, and a son Loring B., who died in childhood. 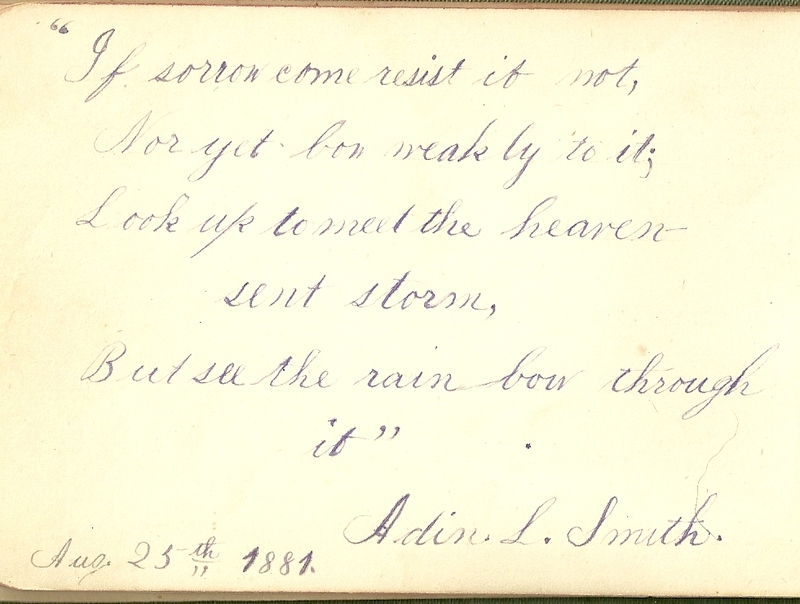 Adin L. Smith died in 1927 at Boston, Massachusetts. 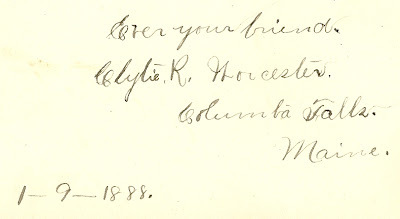 Autograph page written on January 9, 1888 by Clytie R Worcester of Columbia Falls, Maine, in the autograph book of Berniece E. Allen of Centerville, Maine. Clytie R. Worcester was born in Columbia Falls, Maine on 22 April 1871, the daughter of Samuel Cummings Worcester and his wife Rosina (Reynolds) Worcester. Her paternal grandparents were Clement Fernald Worcester and wife Tamson Willey (Cummings) Worcester. Her maternal grandparents were Ezekiel and Rosanah W. Robinson. In a few places online, I found that some have interpreted Clytie as Clinton R. Worcester; however, I found Clytie's birth record showing her to be a female, and Census data bears that out. Perhaps she had a brother Clinton, maybe even a twin. I found Clytie in the 1900 US Census, working as a servant in a large household or boarding house in Putnam, Connecticut. I couldn't find her again until the 1930 Census, when she was living in Cambridge, Massachusetts, married to Una Worcester, a blacksmith. According to his naturalization records, Una Worcester, born around 1886 in Lancashire, England, had changed his name from William Dawson. in this Census, Clytie was working as what I'm interpreting to be a professional lecturer. When Una Worcester filled out his World War II Draft Registration card, he was living in Amherst, Massachusetts and gave the name of Mrs. Margaret Worcester as his contact. Whether this meant that Clytie had died by then or she and Una had divorced, I don't know. I haven't yet found Clytie's date of death. If you have any corrections, additions or insights, especially about Una Worcester/William Dawson, regarding the information provided above or in the family tree below, please leave a comment or contact me directly. 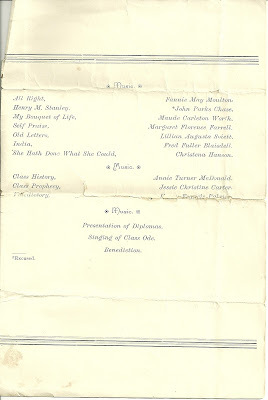 For more information on the Worcester and related families in western Washington County, Maine, see the page for Clytie R. Worcester at the Maine and Maritime Canada Genealogy network. 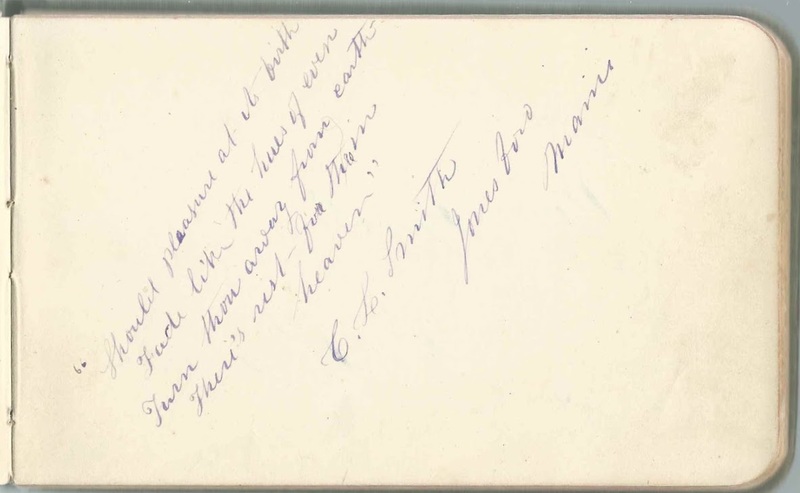 Page, unfortunately faint, in the autograph book of cousin Bernice E. Allen of Centerville signed by Clifford Gilmore Allen of Centerville, Maine. Clifford Gilmore Allen was born about 1870, possibly at Centerville, Maine, the son of Edward Foster Allen and his wife Eunice E. Norton. 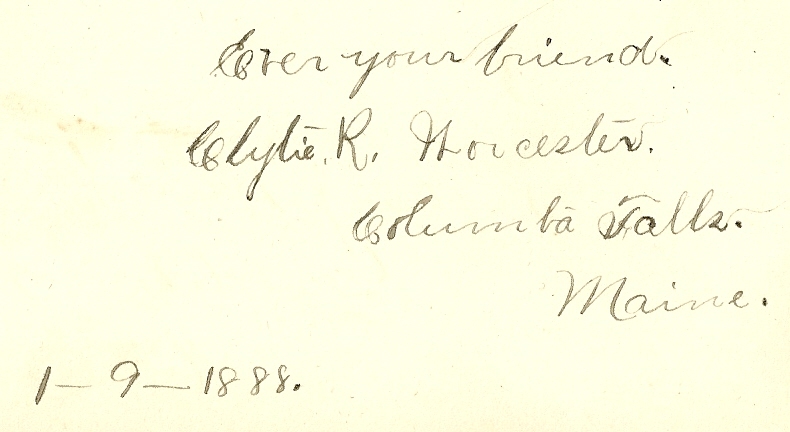 Clifford's father Edward Foster Allen was born 14 March 1825 at Centerville, Maine. On 10 July 1864, at the age of 40, when he had six children, he enlisted as a private in Company F of the Maine 20th Infantry Regiment. He mustered out on July 16, 1865. He had two more children after the war. Clifford was the last of his children. Clifford Gilmore Allen's paternal grandparents were Henry and Leah (Jacobs) Allen, both born, I believe, in Centerville, Maine. Clifford's mother, Eunice E. Norton, was born 18 September 1828 at Addison, Maine. Her parents were Enoch Norton and Phebe (Norton) Norton, both born in 1796. Her two grandfathers, Seth Norton and Abraham Abraham of Addison, Maine, were brothers, sons of Seth and Amy Daggett (Norton) Norton. 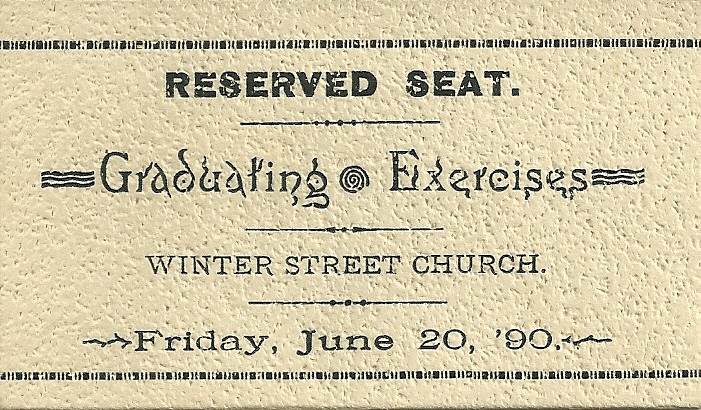 Clifford Gilmore Allen made his way from the small village of Centerville, Maine, to Boston University, where he graduated about 1900. He subsequently moved west where he became a professor of languages and philology at Leland Stanford Jr. University, now known simply as Stanford. In the 1910 Census of Palo Alto, California, he listed his occupation as professor. He wrote books on language and philology. In 1913 he married Alice J. Chalfant, who was born 18 June 1884 at Ukiah, California, the daughter of Samuel Jesse Chalfant and his wife Elizabeth W. Cunningham. I don't have information on her grandparents except that her maternal grandmother's first name was Mary. Samuel Jesse Chalfant moved from his birth state of Maryland to California. In the 1870 Census of Big River, Mendocino County, he gave his occupation as saw filer. In the 1880 Census of Little River, Mendocino County, he gave his occupation as superintendent of a mill. In 1884, applied for a patent on a Saw Tooth Swage. Also in 1884, his daughter Alice was born, and he built a house for his family in Mendocino, a house that still stands today, at 45080 Calpella Street. Clifford Gilmore Allen and his wife Alice J. (Chalfant) had two sons, John Gilmore Allen and Robert Chalfant Allen. John Gilmore Allen was born in France on 9 December 1913. He majored in political science at Stanford. He died in the 1980s in California. Robert Chalfant Allen was born 19 November 1918 in California. He also attended Stanford University. After graduation, he joined the US Navy as a Lieutenant Junior Grade. Sadly, he went down with his ship in World War II. As I was researching this family, about which I knew nothing when I started, I experienced the highs and lows of genealogy. First, the high, when learning that a young man from a small village in Maine grew up to receive a doctorate, become an author and Stanford professor. Kudos to him, his parents and his village teachers. Then, the low, when I discovered that his younger son died in World War II. For more information on this family, see the page of Clifford Gilmore Allen at the Maine and Maritime Genealogy network. Andrew Harrington Bibber was an officer in the First Maine Cavalry and Assistant Adjutant-General of Volunteers Infantry Regiment. Andrew Harrington Bibber was born at Lubec, Maine, on 22 July 1836, the son of Charles H. and Adeline Ann (Harrington) Bibber. From online research, I found that the name Bibber likely goes back to the spelling Vibert, a European name that likely started out as a Christian name and over time became a surname. His paternal grandparents were Thomas and Dorcas (Pettingill) Bibber of southern Maine. His maternal grandparents were Andrew and Abigail "Nabby" (Clark) of Eastport, Maine. With President Lincoln's call to the states for 75,000 men, Maine responded, not with the one requested, but with ten regiments, fully armed and ready to serve for three years. 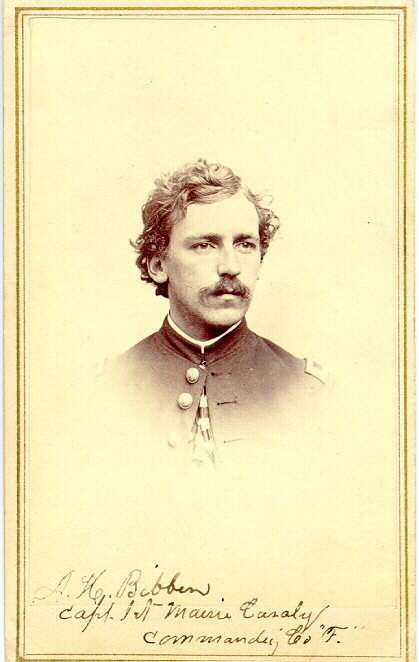 Andrew Harrington Bibber became a sergeant in the First Maine Cavalry and rose through the ranks to full Captain of Company F, First Maine Cavalry in July of 1864. After mustering out on 13 March 1865, he became a commissioned officer as Assistant Adjutant General of Volunteers Infantry Regiment. His first marriage was to Sarah Houghton, daughter of Hon. Partman and Orinda Ann (Prince) Houghton. Partman Houghton was a member of the Maine state legislature, but is probably best known today for a fund he endowed, still extant, whereby many elderly women in Eastport are given a gift of money during the holiday season. It would be interesting to know what inspired him to set up this fund, something very sad, no doubt. Andrew had a dry goods business and enjoyed painting marine scenes, for which he was receiving some acclaim. Andrew and Sarah had two daughters: Edith Prince Bibber, born 23 July 1870 and Sarah P. H. Bibber, born 24 December 1871. Less than two weeks after Sarah H. P. Bibber's birth, Sarah (Houghton) Bibber died, on 3 January 1872, likely as the result of complications of childbirth. 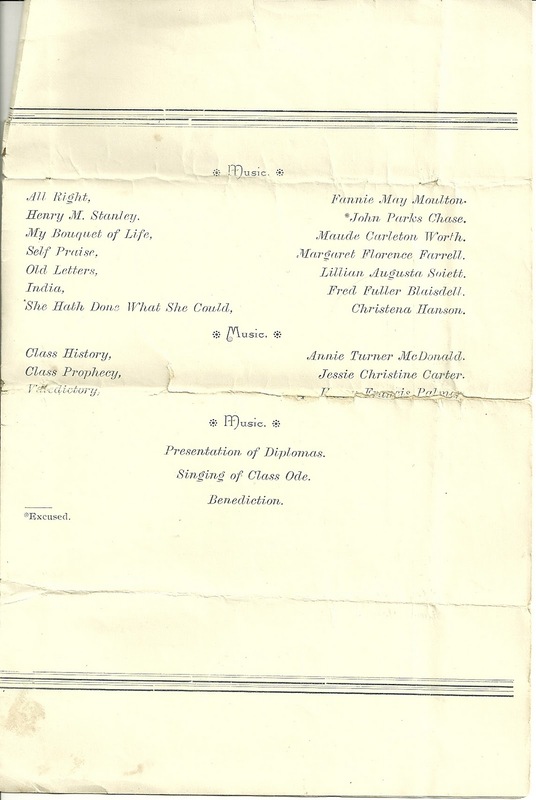 On 27 September, 1876, Andrew Harrington Bibber married again, to Annie Louise Ansley (also seen in the variation Annesley), who was born at Saint John, New Brunswick, Canada, on 11 July 1854, and educated at Saint John Young Ladies Academy and at Vassar College. Her father, John, a mill owner and government official, was the son of Devonshire immigrant Daniel Ansley, who became a successful shipping merchant at Saint John. Annie's mother, Sarah (Hayden) Ansley, a descendant of John Alden, was born on Beacon Hill in Boston. Sarah P. H. Harrington died shortly after her father's marriage to Annie. Andrew and Annie had a daughter, Alice Alden Harrington, born 30 October 1883 at Eastport, Maine. In 1890, Andrew, Annie, Edith and Alice moved to Orange, California, where they purchased twenty acres to develop an orange orchard. Andrew later resumed the dry goods trade. In his later years, he took up his brush again and became known for his seascapes. Andrew Harrington Bibber died on 6 October 1913. Annie, Edith and Alice remained in California after his death. Annie died at Los Angeles on 5 February 1938. Edith, a Vassar graduate like her stepmother, was a music teacher who gave private lessons at her home; she died in 1964, at Los Angeles. Alice Alden Bibber graduated from the Girls' Collegiate School of Los Angeles and later married her first cousin, Roy Bibber, who had by then changed his name to Dion Ray O. Van Bibber. The marriage ended in divorce. Alice died in 1960 at Los Angeles. Her ex-husband died in 1985 in Texas. If you have any corrections, additions or insights regarding the information presented here, please leave a comment or contact me directly Thanks! I found a very interesting site on the Vibert Family, which cites Andrew Harrington Bibber as one of its "famous members". Incidentally one of the other "famous members" was James Bibber, who was learning to weave with my ancestor Elizabeth (Meader) Hanson of New Hampshire. During this time she and her children were attacked by Indians; two sons were killed. Elizabeth and another son (my ancestor) and daughters were carried off. All but one were eventually ransomed. For more information on this family, see the page for Andrew Harrington Bibber at the Maine and Maritime Canada Genealogy network. 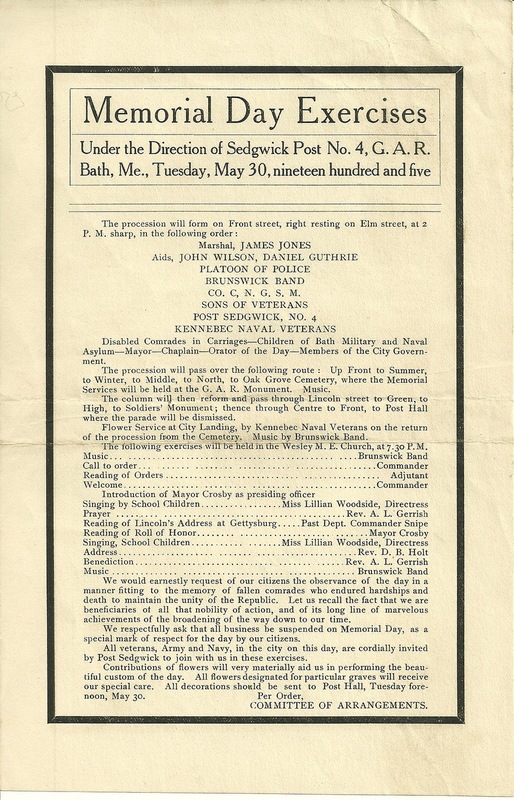 1905 Program for the Memorial Day Exercises of Sedgwick Post #4, Grand Army of the Republic, at Bath, Maine. 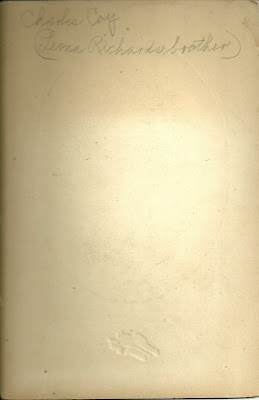 This item was found in the 1850s autograph book of Ellen Augusta Crooker of Bath, Maine. Ellen, who married John Nicholas Blaisdell of Harpswell, Maine, had died in 1893, so presumably one of her children placed the program in her album. 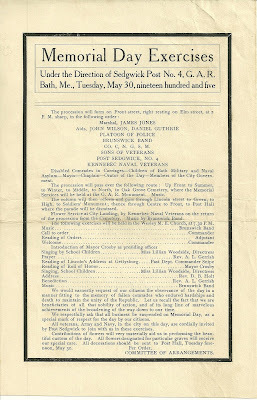 Under the Direction of Sedgwick Post No. 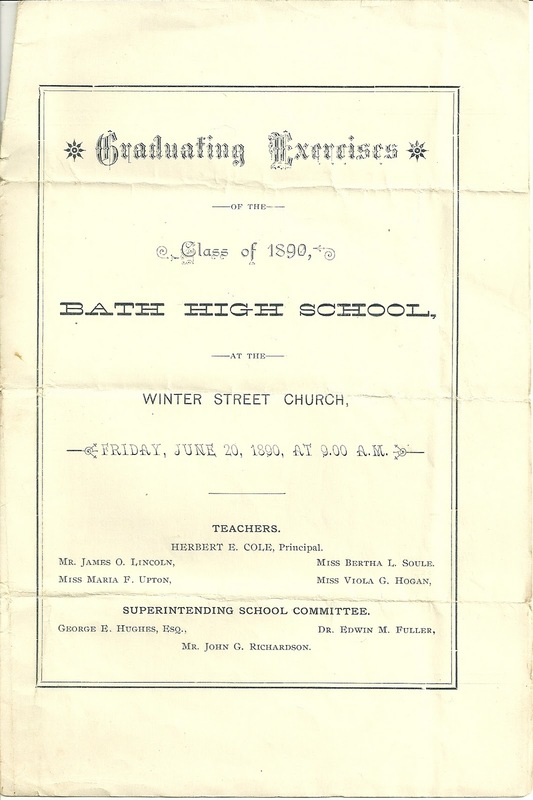 4, G. A. R., Bath, Me., Tuesday, May 30, nineteen hundred and five. The procession will pass over the following route: Up Front to Summer, to Winter, to Middle, to North, to Oak Grove Cemetery, where the Memorial Services will be held at the G. A. R. Monument. Music. The column will then reform and pass through Lincoln street to Green, to High, to Soldiers' Monument; thence through Centre to Front, to Post Hall where the parade will be dismissed. Flower Service at City Landing, by Kennebec Naval Veterans on the return of the procession from the Cemetery. Music by Brunswick Band. 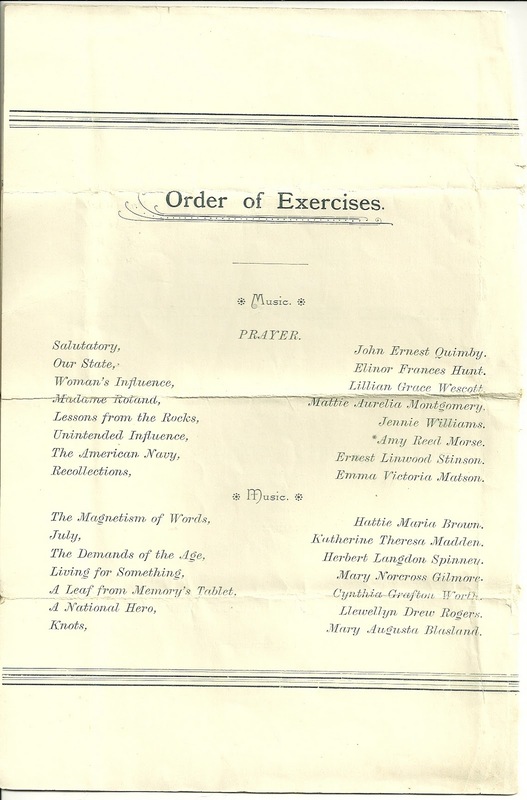 The following exercises will be held in the Wesley M. E. Church, at 7:30 P.M.
We would earnestly request of our citizens the observance of the day in a manner fitting to the memory of fallen comrades who endured hardships and death to maintain the unity of the Republic. Let us recall the fact that we are beneficiaries of all that nobility of action, and of its long line of marvelous achievements of the broadening of the way down to our time. We respectfully ask that all business be suspended on Memorial Day, as a special mark of respect for the day by our citizens. 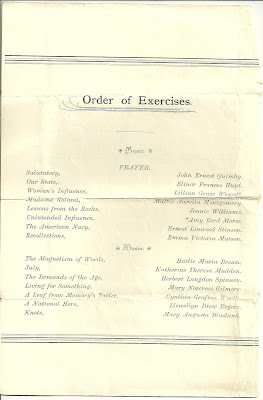 All veterans, Army and Navy, in the city on this day, are cordially invited by Post Sedgwick to join with us in these exercises. Contributions of flowers will very materially aid us in performing the beautiful custom of the day. All flowers designated for particular graves will receive our special care. All decorations should be sent to Post Hall, Tuesday, forenoon, May 30. 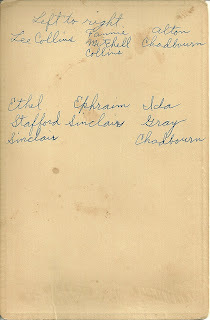 Clipping found in the autograph book of Ellen Augusta Crooker of the Bath, Maine area, featured in another post. She would marry John Nicholas Blaisdell of Harpswell, Maine. The signatures in the autograph book date to the 1850s, but there are some newer items, like this clipping, tucked inside. 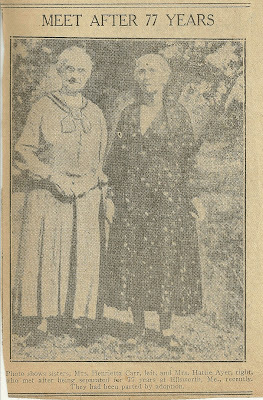 The clipping discusses a genealogy of the Crooker family then in the works and a legend of the original Crooker settler that the author was debunking. See the transcription near the bottom of this page. By Henry W. Owen, Jr.
Man people in this locality will no doubt be interested to know that a genealogy of the Crooker family is in preparation, which will include the Bath branch represented by the descendants of Isaiah Crooker, who settled in Bath about 1750, founding a family which has played an important part in local history. The gentleman who has undertaken this task is William A. Walter, 35 Livingston Street, Bridgeport, Conn., who is himself a Crooker descendant, though not of Bath's Isaiah. One important result already of Mr. Walter's research is proof of the error of a local tradition which was romantic indeed, but for many reasons seemed improbable. This old story was to the effect that five Crooker brothers emigrated from Scotland to Cape Cod, whence three of them sailed in company for Maine, but after being shipwrecked on or near Seguin, became separated, Isaiah settling in Bath and the other two elsewhere. An incredible feature of the story was that Isaiah, who had barely if at all attained his majority, arrived with $10,000 in his pocket. In-so-far as the origin of the Crookers is indicated by evidence, it was Welsh, and not Scotch. Moreover, Isaiah, instead of himself having been an immigrant into New England, belonged to the fourth generation of the family in New England. The original immigrant was one Francis Crooker, born in Britain about 1622, who settled in Marshfield, Mass. His wife was Mary Gaunt, and of three known sons, one was born about 1654 and named Jonathan. Jonathan Crooker, the son of Francis, lived his life in Marshfield, where he married Mary Burroughs and they had a family of 10 children of whom the fifth in seniority was named Francis for his grandfather. This second Francis married twice and his second wife was Patience Childs, whom he wed in March, 1723. This family were in Marshfield up to 1750, after which Francis' name disappears from the records. Mr. Walter has not as yet located him elsewhere, but thinks it likely he removed to Maine. The eighth of 11 children of Francis was Isaiah, whose birth Jan. 28, 1729/30, is recorded in Marshfield. This coincides with the age at death of Isaiah Crooker of Bath as recorded on his tombstone in the old cemetery at Witch Spring. The concensus of the best opinion is that it was this son of Francis who came to Bath to make his home. It seem probable that the romantic wreck at Seguin resulted from a remarkably similar event which befell in the same place some of the Harding family to which Isaiah's second wife belonged. and has been able to follow some of the lines down to date. As in the case of most old families, there have been in the course of two centuries intermarriages with many other families, so that there are doubtless today as many if not more descendants of Isaiah Crooker wearing other family names than those to whom the male lines have transmitted the original sur-name. Many of the descendants in the distaff lines, as well as those in the male lines, are well known in local history. 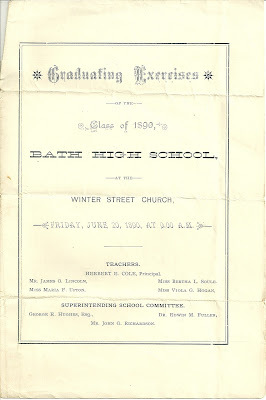 Some of the Bath families into which Crooker daughters or granddaughters have married and now have descendants are to mention a few: Whitmore, Lunt, Webb, McCobb, Babb, Foster, Hodgkins, Scholfield, Sewall, Bosworth, Blaisdell, Jackson. It is an endless task for a genealogist to make contact with representatives of such families now living, many of whom might have records or other data which the genealogist would like to have, to supply the want of adequate public records. Another difficult is that genealogical data collected by some known previous worker in the field have become lost to view. One such case that Mr. Walter has encountered is that of one Zenas Crooker of Waterville, who is known to have gathered Crooker family data years ago, recent search for which has been entirely fruitless. No doubt Mr. Walter would welcome communications from any person who have any genealogical date which ought to be Crooker family. 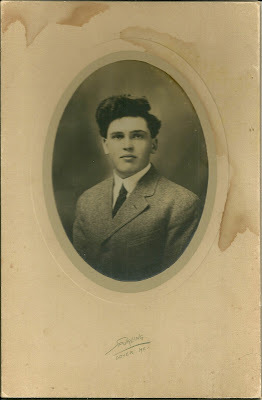 Photograph of a young man identified on reverse as Charles Coy, brother of Leona Richards. The photograph was taken by the Spurling studio of Dover, Maine. Charles M. Coy was born 22 June 1893 at Monson, Maine, the son of Forrest H. Coy and wife Martha "Mattie" Bennett (Drake) Coy. His paternal grandparents were Charles Melvin Coy and Elmira S. (Bean) Coy. His maternal grandparents were Elhanan Gay Drake and Delana Snow (Strout) Drake. On 27 June 1928, Charles M. Coy married Marion E. Chandler. She was born 24 January 1903 in what is now Dover-Foxcroft, Maine, the daughter of Franklin E. Chandler and Mabel E. (Brown) Chandler. Her paternal grandparents were James and Sarah Josephine (Hurd) Chandler. Her maternal grandparents were Lysander C. Brown and Annie Rose (Haskell) Brown. Marion was a teacher in Dexter, Maine, as I've heard from a reader, one of her former students. I'm not sure if the couple had any children or not. In the 1930 Census, they're in Dexter, Maine, and have no children living with them. See an obituaries for Charles M. Coy and Marion E. (Chandler) Coy. Note that Charles' sister Leona (Coy) Richards, the sibling mentioned on the reverse of his photograph, survived him. For more information, see the page for Charles M. Coy and Marion E. (Chandler) Coy at the Maine and Maritime Canada Genealogy network. 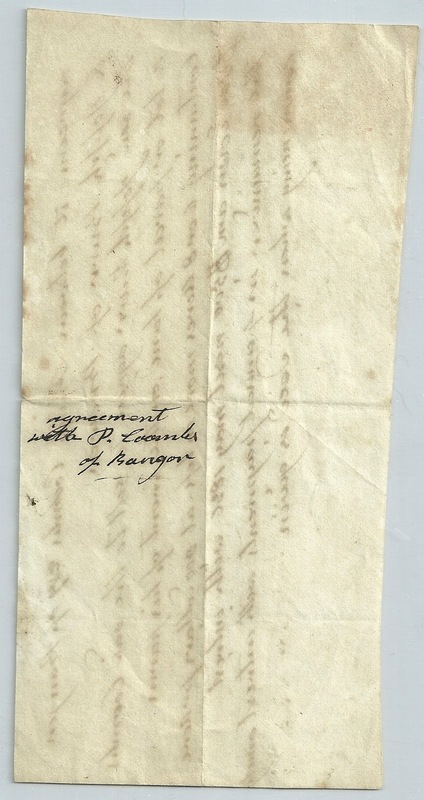 1856 or 1836 document detailing an agreement between Philip Coombs of Bangor, Maine, and Joseph Brown, or Joseph Brewer, of Brewer Maine. 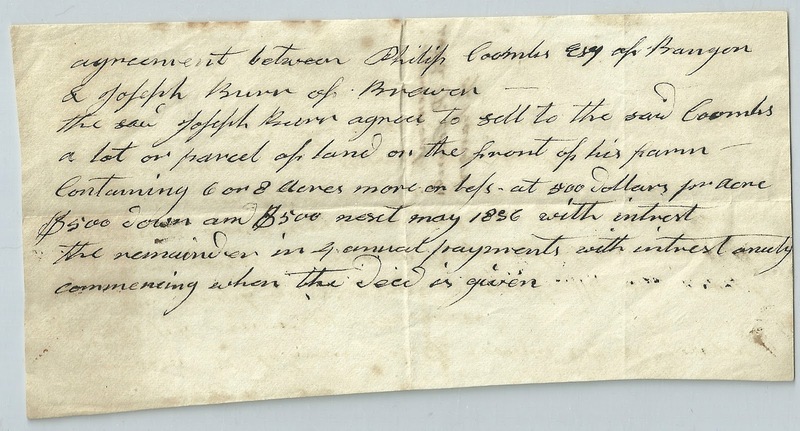 Depending on the date of this document, there are several possibilities for a Philip Coombs. If the date is 1836, there are three options, a grandfather, father and son, successive generations of a noted Bangor, Maine family. Philip Coombs (1), son of William and Jane (Greenleaf) Coombs, was born 10 July 1770 in Massachusetts and died November 13, 1848 in Maine. Philip married Elizabeth Harrod, who was born January 15, 1775 at Newburyport, Massachusetts, the daughter of Banjamin and Mary (Morrill) Harrod. Philip and Elizabeth had a son Philip Henry Coombs (2), born February 21, 1803 in Massachusetts. By about 1814, the family had moved to Bangor, Maine. In 1836 Philip Coombs (1) donated land originally called Coombs City Common and now known as Chapin Park; it's located on Bangor's east side. Philip Henry Coombs, who came to Bangor, Maine, with his parents about 1814, married Eliza Webster Boardman, the daughter of Jonathan Boardman Jr. and Sarah (Horton) Boardman. Eliza was born August 26, 1805 at Massachusetts. Philip Henry Coombs and Eliza had a son Philip Coombs (3), born August 5, 1833 at Bangor, Maine. Philip Coombs (3) married Sarah Forbes Woodhull, who was born January 14, 1830 in Maine, the daughter of Richard and Sarah (Forbes) Woodhull. Philip Coombs (3) and Sarah had a son Philip Henry Coombs, but he wasn't born until 24 December 1856 at Bangor, so could not be one of the parties of this document. 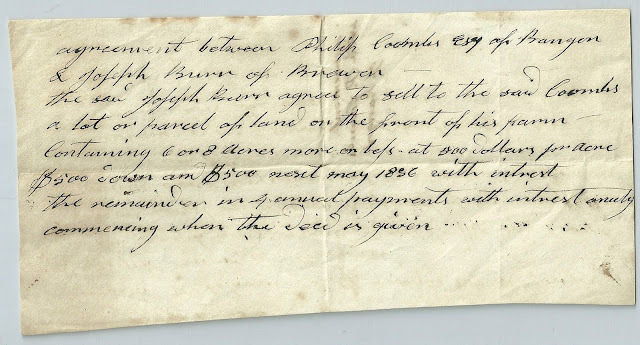 Hopefully a reader will come forward to give an opinion on the date of the document and, more importantly, on whether the other party is Joseph Brown of Brewer, Maine or Joseph Brewer of Brewer, Maine. If you have corrections and/or additions to the information presented here, please leave a comment or contact me directly. 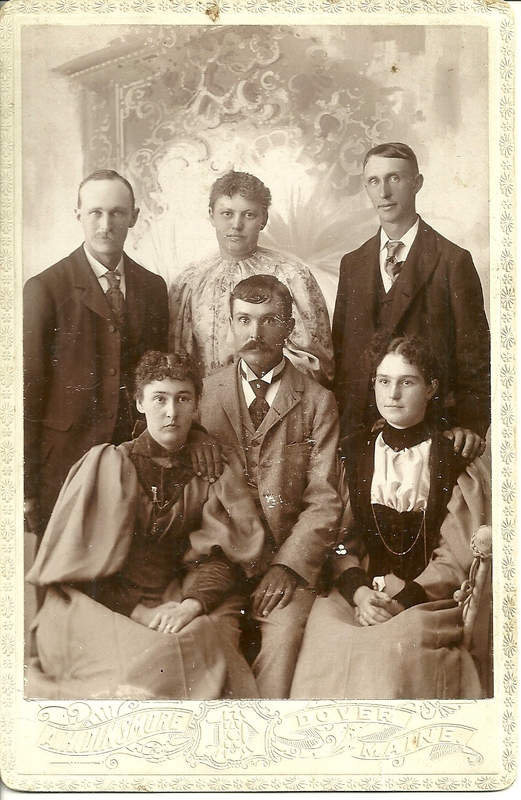 Ephraim and his wife Ethel H. (Stafford) Sinclair in a group photo that includes husband and wife couples of John Lee Collins and wife Fannie Emmie (Mitchell) Collins and Alton Chadbourn and wife Ida M. (Gray) Chadbourn. Ephraim is the man sitting in front, with wife Ethel at his left, as viewed in the photograph. The photograph was taken by the Dinsmore studio of Dover, Maine, which is near the Harmony, Maine area in which the couples lived. 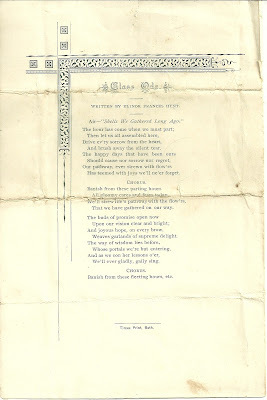 Ephraim Henry Sinclair was born March 1870 in Maine, the son of Martin Van Buren Sinclair, born in Dennysville, Maine in 1847, and his wife Eliza L. (Cook) Sinclair, born in Corinna, Maine, in 1851. 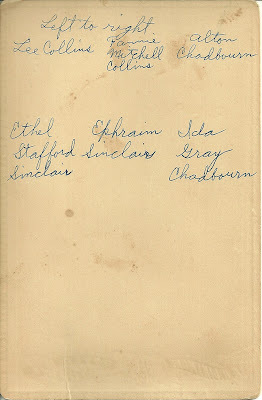 Ephraim's paternal grandparents were Thomas Shaw Sinclair and his wife Ruth B. (Cook) Sinclair. Thomas Shaw Sinclair's father was George Amesy Sinclair, who was born in Hallowell, Maine in 1793. I believe "Amesy" was a nickname for Amasa, so perhaps he was George Amasa Sinclair. He had a son by the name of Amasa, so perhaps it was a family name. I haven't yet learned the names of George's parents. I would love to know what drew him to Washington County, Maine. I believe the parents of Ruth B. (Cook) Sinclair were Samuel and Lydia Cook. On 8 April 1896 in Harmony, Maine, Ephraim Henry Sinclair married Ethel H. Stafford. She was born in July of 1873 in Maine, the daughter of Franklin Joseph Stafford and wife Abbie (Brown) Stafford. 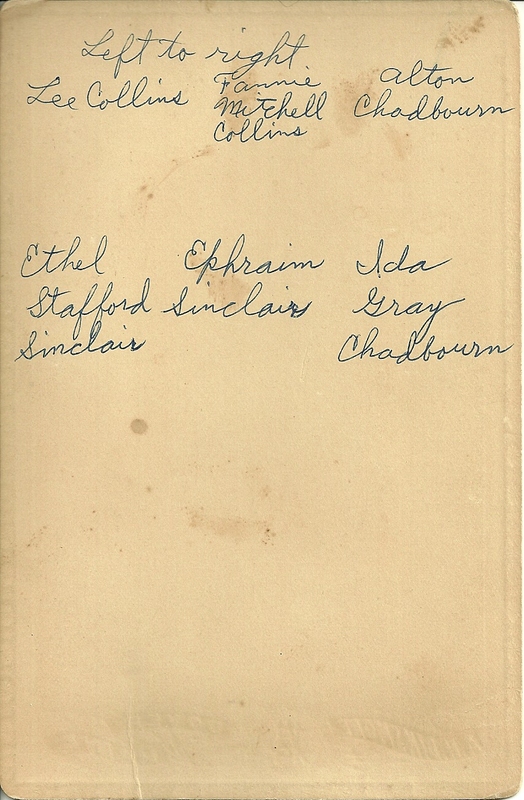 Her paternal grandparents were Obadiah Stafford and Rebecca (Gray) Stafford. Her maternal grandparents were Richard L. (possibly either Llewellyn or Lord) Brown and wife Mahala (Watson) Brown. Ephraim and Ethel raised a family of, I believe, three children in Harmony, Maine. 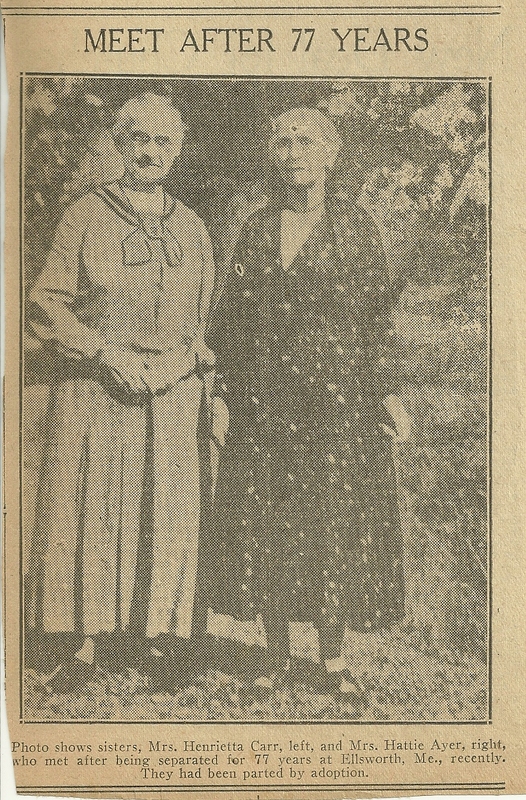 Ephraim died in 1954, and Ethel in 1938. 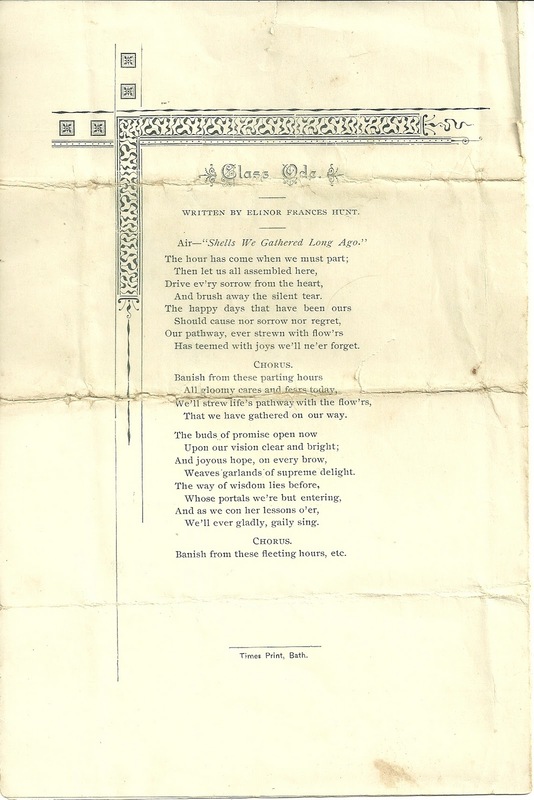 For more information, visit the page at the Maine and Maritime Canada Genealogy network for Ephraim Henry Sinclair and wife Ethel H. (Stafford) Sinclair.